Of course no one ever thinks to save a slice of the cake for the baker so I can't personally say if it was good or not. Though I did hear that it was well liked and my husband brought home the empty cake container. The fact that it vanished in one afternoon is proof to me that it must have been good. My husband did say he had a slice and enjoyed it. The original recipe did not mention anything about precooking the crust so I added those directions in. Preheat the oven to 325 degrees. In a medium bowl, mix together the cookie crumbs, 3 tablespoons of sugar, and melted butter. (I greased the pan first and placed a piece of parchment paper on top and then greased the paper. )Press the mixture into the bottom of a 9 inch springform pan. I then baked the crust for ten minutes. In a metal bowl over a pan of simmering water(double boiler), melt the white chocolate chips with half-and-half, stirring occasionally until smooth. In a large bowl, mix together the cream cheese and 1/2 cup of sugar until smooth. Beat in the eggs one at a time. Blend in the vanilla and melted white chocolate. Pour half of the batter over the crust. Spoon 3 tablespoons of the raspberry sauce over the batter. 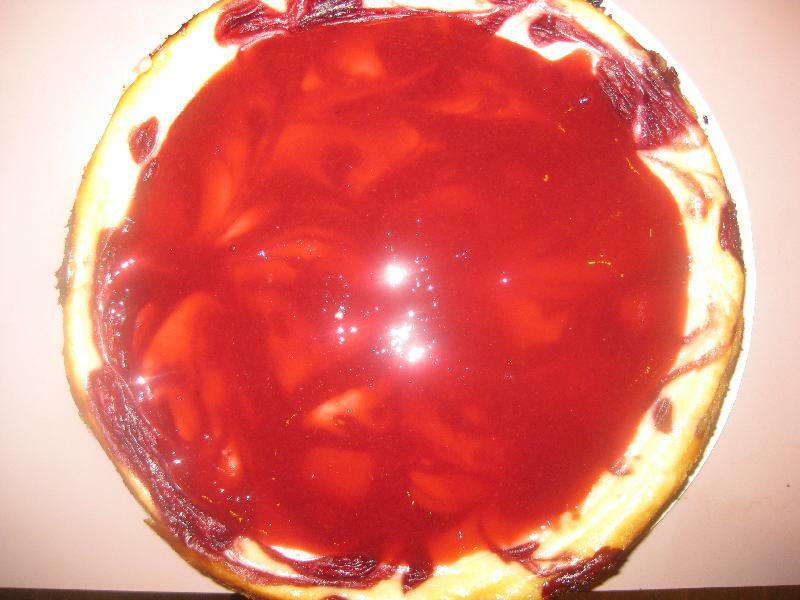 Pour the remaining cheesecake batter into the pan, and again spoon 3 tablespoons of raspberry sauce over the top. Swirl the batter with the tip of a knife to create a marbled effect. anonymous : It is ok. He never remembers to save me a slice but at the same time doesn't want me to cut one out before he takes it in. anonymous : Ruh ROH I can't believe I didn't think of saving a slice for you to try!!! BAD Birthday Girl I am :(. So Sorry about that!!! Your hubby should have reminded me. Now I really owe you!! anonymous : All I can say is WOW!! I am the co-worker of Kathy's hubby that requested a birthday cheesecake since she is one of the best cake creators I've ever met! 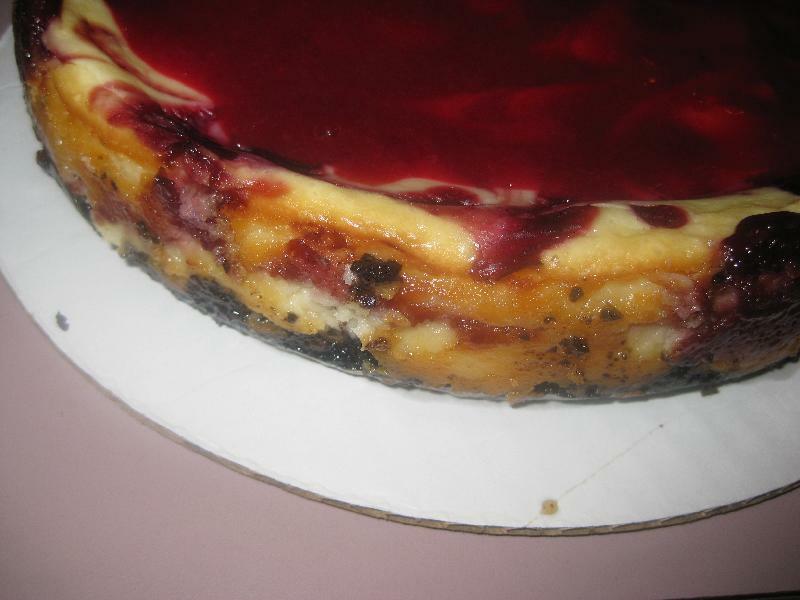 This cheesecake is AWESOME; while rich in flavor it's not too sweet but definitely is fresh and creamy with the best raspberry flavor from fresh raspberries that I have ever tasted. The entire office LOVED IT and wished we had seconds. It was YUMMY!!! Thank you from the bottom of my heart for making this for me!! I owe you!! !